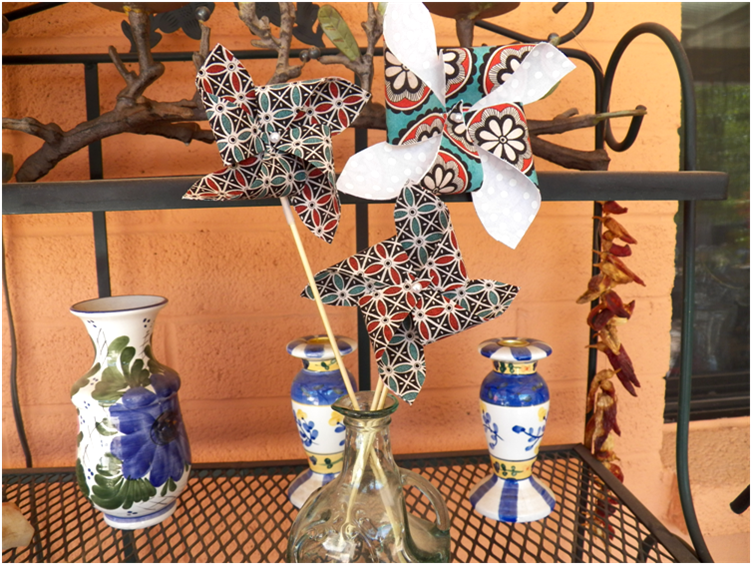 Ever since I made those paper pinwheels for the 4th of July, I've been wanting to try some pinwheels made of fabric. I made these in a morning and was happy with the results - with a couple of qualifiers! 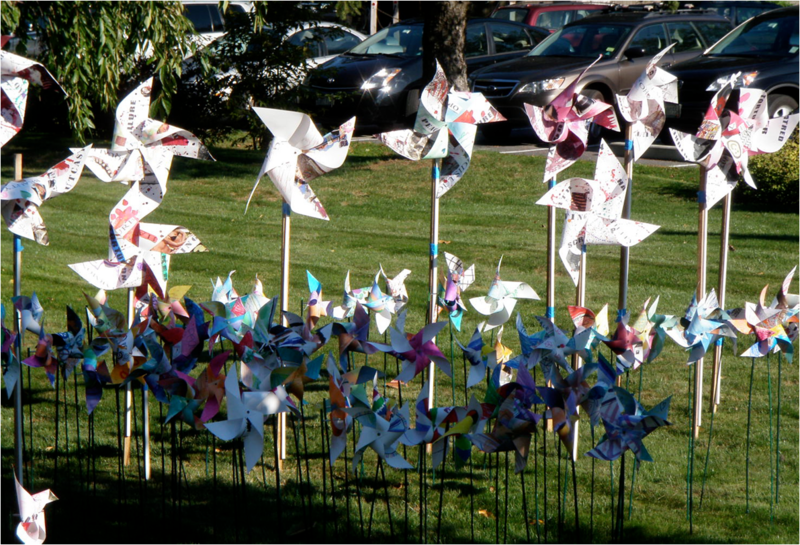 I used thin fabric and am guessing that thicker fabric (like a broadcloth, denim, or duck) would give stiffer pinwheels. And the smaller ones spun much better than the larger one did. They do spin when I blow on them hard or stick them under the air conditioning vents, though! 1. 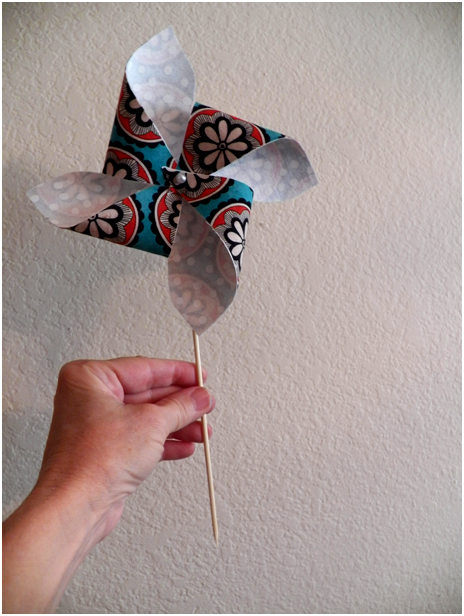 Using the pattern, trace a pinwheel shape onto one side of Steam-A-Seam 2. 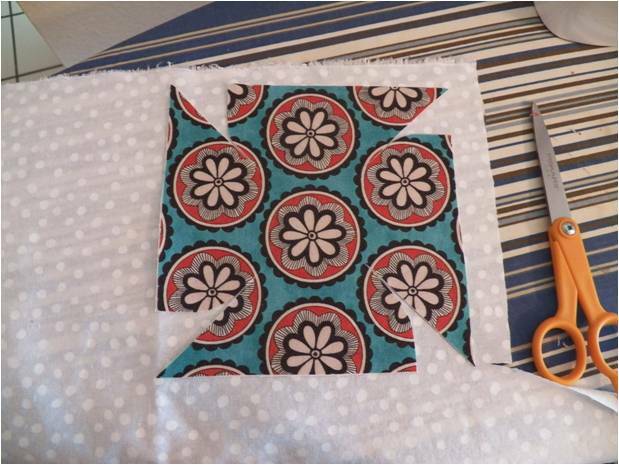 Remove the other side's backing, iron onto the wrong side of one of your fabrics, and cut out. 2. 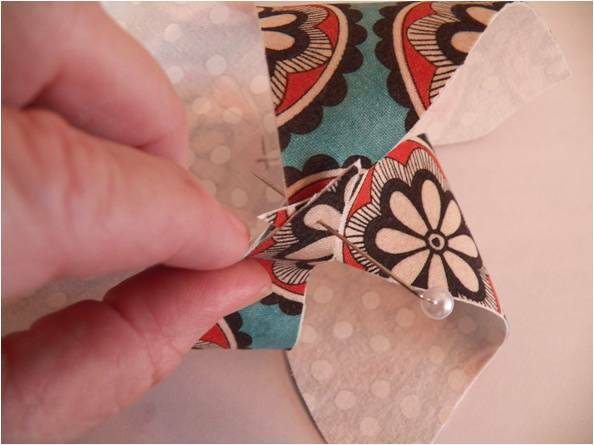 Peel off the remaining backing and iron onto the wrong side of your second fabric. Cut out. 3. 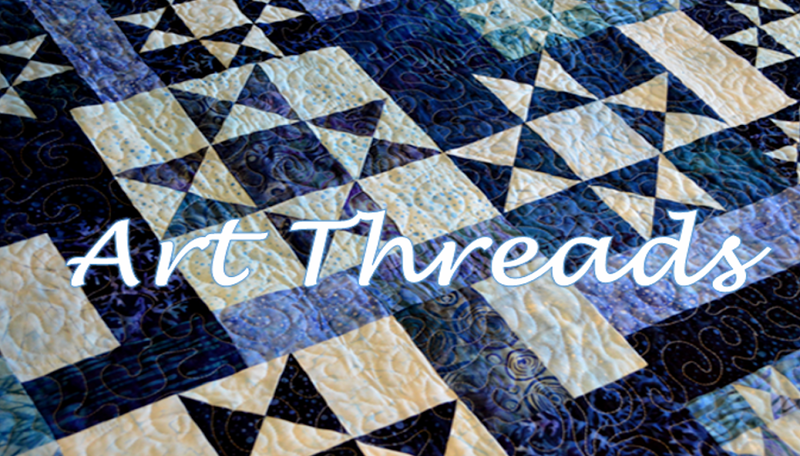 Make a small x in the center of your fabric you want to be on the inside. Push the florist pin through each triangular edge (where the dots are on the pattern) of the pinwheel, from the outside fabric side. Push the pin through the center marking. 4. Put a plastic pony bead on the pin and use needle nose pliers to bend the pin down at a right angle. 5. Wrap tape loosely around a dowel or cooking stick, near the top. Push the pin inside the tape and next to the stick. 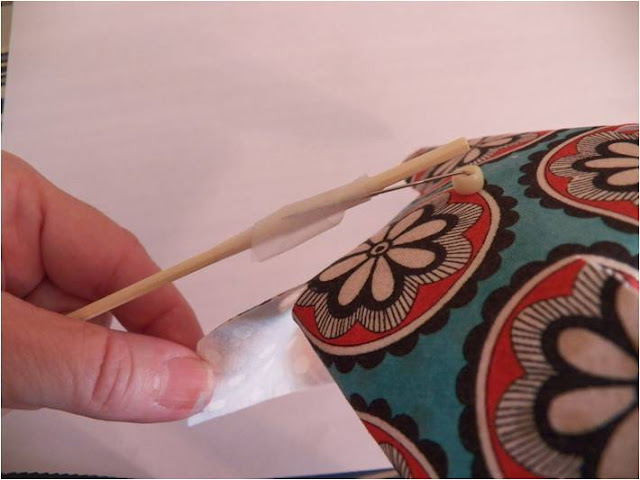 If your pin sticks out the bottom of the tape, add more tape to cover it up. 6. 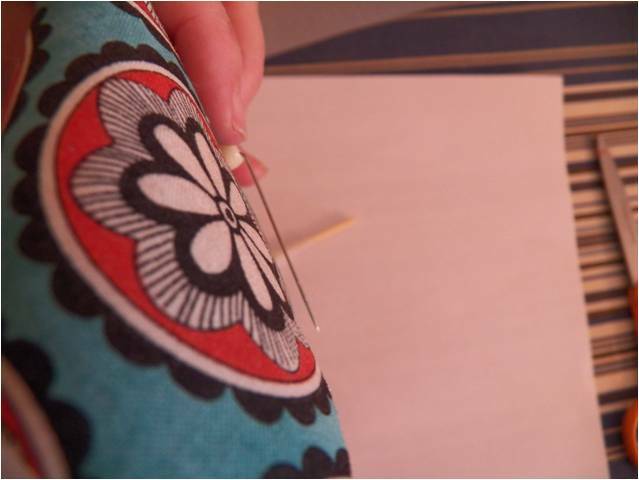 Adjust the angle of the pin so the pinwheel stands free of the stick and turns. This is not political. Peace doesn’t necessarily have to be associated with the conflict of war, it can be related to violence/intolerance in our daily lives, to peace of mind. To each of us, peace can take on a different meaning, but, in the end, it all comes down to a simple definition: a state of calm and serenity, with no anxiety, the absence of violence, freedom from conflict or disagreement among people or groups of people. 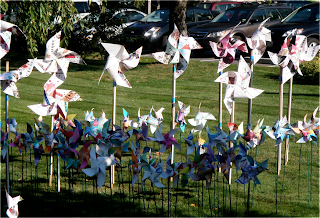 See the project's website for more information, photo galleries, and additional pinwheel instructions.